Photokina wrapped up last week, and I have been trying to following along on the news as best I can. The big news to me was that there wasn’t an awful lot of news, outside of the cameras and lenses I’ve posted about previously. There were a lot of rumors about a new 70-200 VR from Nikon and a new 100-400 IS from Canon, neither materialized. Sigma announced a new revision of their SLR, the DP15; and a new point and shoot, the DP2. The DP2 is similar to their DP1 but complementary with a faster (f/2.8) more normal (41mm equivalent) lens. Probably the biggest news on the camera front was the announcement of a couple of Micro 4/3rds cameras. If you’ve not seen Olympus’s announcement on what it is, Micro 4/3rds is an adaptation of their 4/3rds system to a thinner mirror-less design. The new system is compatible with 4/3rds lenses—through an adapter—but supports a new smaller lighter series of lenses designed specifically to be as compact and portable as possible. The most interesting new camera, at least form an SLR user’s perspective, is probably the Panasonic Lumix G1. Not much bigger than more traditional super zoom point and shoots, it supports interchangeable lenses and a SLR sized (2x crop factor) sensor, giving it more flexible lens choices and potentially better low light capabilities. That coupled with the forth coming 20mm f/1.7 (40mm equivalent) micro-4/3rds lens would make quite a powerful yet unobtrusive camera for street photography. Some things that did catch my eye include the announcement of Adobe Photoshop CS4, which brings 64-bit support to windows machines and support for using your video card to accelerate calculations among other things. I could write about it, but most of the cool features are demonstrated in this podcast (creativesuitepodcast.com), and it’s far more fun to watch than it is to read about. On the storage front, SanDisk announced Extreme III and Extreme IV flash cards, including 32 GB Extreme III cards. Speaking of which, while it’s been trumpeted all over the web as of late, but SanDisk has been running a rebate on their compact flash media for the last few weeks (ends the 11th of October), on their flash media. 16GB Extreme three cards are going for as little as $7 to $25 a card in some places, if you can find them in stock. Most of the online camera stores are participating, so if you’re in the media market right now that may be a place to look. The other announcement in storage was by a company I’ve never heard of, Pretec (pretec.com), of two new compact flash flashcards, a 64GB and 100GB 233x (35MB/s transfer) flashcards. Something that’s sure to come in handy with the today’s high resolution and video producing cameras. I’ve never used them, and I can’t seem to find them listed any ecommerce sites I’ve used for ordering media, so I have no idea if they work well or even at all. On the lens front, Tokina has added motors to their Nikon mount lenses. I’m not sure if this is good or bad yet though. On the up side, they will focus on the D40, D40x and D60 bodies; on the down side, Tokina doesn’t have an Ultrasonic lens motor design, so they will likely be louder than they otherwise would be when driven by the in body motor. One thing that is for sure, this gives entry level Nikon users access to fast f/2.8 zooms of decent optical quality in focal lengths of 11-16mm, 16-50mm and 50-125mm. All told, it’s not a bad for set of pretty close to pro grade lenses and can be had for less than $1900 for the three. Also completely unrelated to Photokina, there is currently an update for Adobe Lightroom 2 in the final stages of testing. According to the Adobe Labs page, it fixes several stability issues and makes some performance improvements. As a Lightroom user, I’m keeping on top of this, and I can only hope it fixes a couple of the issues that I’ve experienced with Lightroom on Windows XP. If you’re looking at the Canon manufacturer lens pages, trying to decide on a lens, you may have noticed that at the bottom of the Overview tab for every lens are several icons that provide some information about the lens’s construction or feature set. I have yet to find a comprehensive guide anywhere on the internet that explains what each icon means; nor has Canon elected to make them informative in any way shape or form other than to just be icons. So here is as best as I can decipher them, what the icons mean. See no Eagle, Hear no Eagle, Speak no Eagle. Today we have a lesson in target fixation, namely why it’s important to continue to be aware of your surroundings while your out shooting. Friday I went down to Everglades national park again for the express purpose of trying to get a picture of a Bald Eagle. My thinking being that the USGS bird sheet for Everglades National Park shows them as being common year round (50% of the time there’s a sighting) coupled with their recent removal from the Endangered Species list, meaning there should be more of them, that it should be possible to find a spot somewhere between a nesting site and the ocean where I assume they are fishing, and sit tight and wait for one to fly by. Well the morning was blown searching for possible nesting sites, hey Eagle nests are huge and hard to miss. But alas none were visible from any of the easily accessible areas (i.e. off the park road or any of the boardwalks or trails), and I wasn’t really in the mood to go hiking out across the endless sea of grass to find one either. So I settled for plan B, Osprey’s; and this is where the target fixation comes into play. 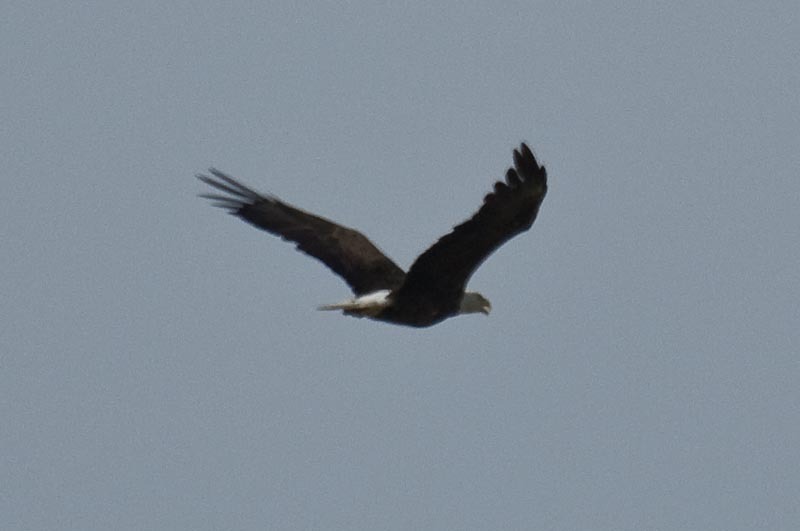 While sitting on an Osprey waiting for it to take off–which it did some 6 hours later (yes I waited that long)–I was overflown by my eagle. And yes, I totally missed the approach and flyover because I was so busy waiting for the bird in the viewfinder to take off. Talk about shooting one’s self in the foot.